"The movement to create a healthier food and agriculture policy in the US has been slowly and steadily gaining ground for well over a decade." If you've been reading the popular books and articles over the past several years exposing the shortfalls of industrial food, then you know that how we produce food is directly linked to our land, environment, and our health. Many people are starting to catch on by shopping at farmer's markets or CSAs and sourcing foods that are sustainably produced and processed as little as possible. But how do we make changes on a big level? 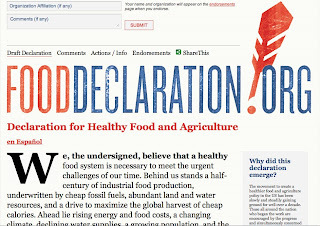 A Food Declaration, that's how! A non profit group called Roots of Change gathered esteemed experts who would represent all facets of the challenge: animal welfare to health and ecology, and farming to labor and social justice. These experts worked together to draft a document calling for change in the food system. You can read the Declaration and give your endorsement of it on the website. 1. A clear statement of what kind of policy is needed now, endorsed by a broad base of organizations and individuals with a long-established commitment to a healthier food and agriculture. 2. An invitation to all Americans to join in the improvement effort by taking action in their own lives and communities and by offering them a way to call on policymakers to support comprehensive change. 3. A set of principles from which policy makers can craft policy that will lead to a healthier system. "We, the undersigned, believe that a healthy food system is necessary to meet the urgent challenges of our time. Behind us stands a half-century of industrial food production, underwritten by cheap fossil fuels, abundant land and water resources, and a drive to maximize the global harvest of cheap calories. Ahead lie rising energy and food costs, a changing climate, declining water supplies, a growing population, and the paradox of widespread hunger and obesity. These realities call for a radically different approach to food and agriculture." Click here to read more and give your endorsement.